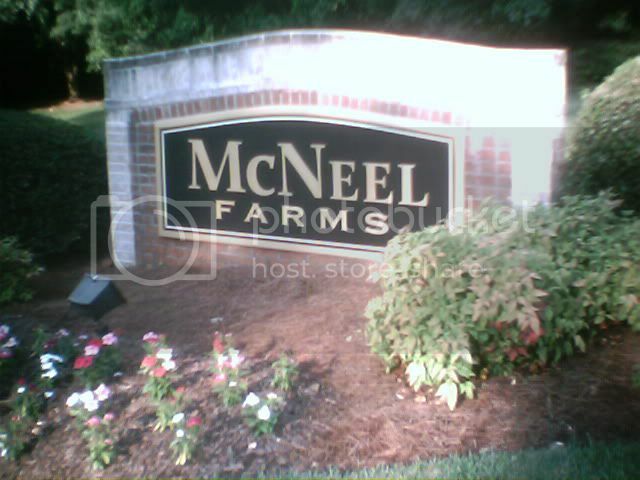 Local Real Estate Comments and Ramblings: McNeel Farms, Marietta Ga.
Last Saturday night my daughter needed a ride to friends house for surprise party and my gps took me to Mcneel Farms. Driving through I was reminded what a beautiful neighborhood this is. Then on Sunday, Barbara and I got invited to come hang out by the pool with some old friends from way back. They have been in their "new" house for several years and we have never been to visit. Where was it? You guessed it! Mcneel Farms! So after two more or less random trips to the same neighborhood I think the real estate gods are telling me that I should let you know about this great neighborhood! Mcneel Farms subdivision, Marietta, Ga. is conveniently located off of John Ward Road road in west Cobb County. The average home size is about 2800 square feet and all of the homes are situated on large, private lots. This is a beautiful part of the county and much of the area is surrounded by the woods, walking trails, and wildlife of Kennesaw Mountain Battlefield National Park. The neighborhood is only minutes away from shopping and dining at the Avenues of West Cobb, and is just a short drive the the major shopping districts on Dallas Highway, Town Center/Kennesaw, or East/West Connector. Are you thinking of selling your Mcneel Farms home?